With the trout fishing season on rivers having now ended, it’s worth recalling how in days gone by this used to signal the end of most game fishing in the North East of England. Apart from one last month up on the reservoirs, for the most part fly fishing came to an abrupt end with the beginning of autumn. Then there came the advent of the winter stillwater trout fishery, but still there was little or nothing on offer for the traditional river fly fisherman. Now though, things have changed again, and there are plenty of opportunities for the game fisherman loath to forsake running water. The trout’s close relative, the grayling, provides a welcome bonus on many North East rivers, with the season for this graceful lady of the stream often coinciding with that for coarse fishing and running right through until March 14th. Despite being a member of the salmon family, the grayling spawns in spring (like coarse fish) and, as well as that seasonal variation, this means they’re in prime angling condition come the autumn and winter. What’s more, the grayling can often be relied upon more than any other species to feed in even the coldest of water temperatures. This means that those hardiest of fishermen can still pursue them when there’s snow on the ground or in the middle of one of those hideous week-long spells of freezing fog that keep air temperatures below zero for days! Huge alterations in approach or tackle choice are not necessary, either – this being a most accommodating species to fish for! Most of the techniques that work for river trout in the spring and summer will remain effective for winter grayling fishing – with subtle variations – as will the coarse fisherman’s staple of float fished worm or maggot, where it’s allowed. Besides the closest Yorkshire rivers (the Swale and Ure both contain them), in the North East the grayling is found in the Tees, Wear, Derwent, Blyth, Till and Tweed. But apart from their Yorkshire compatriots, none of these stocks are thought to be indigenous (in other words they were introduced by man at some stage) and in several instances there were even attempts to eradicate them. Now, though, their presence is welcomed and clubs and riparian owners on most of these rivers promote grayling fishing as sport for at least part of the winter. To begin with, then, we’ll investigate a delightful little river, the Derwent, whose thriving grayling population is the result of several deliberate introductions, the first having taken place way back in 1875 by the founding members of the Derwent Angling Association. According to Alan Farbridge, present day secretary of the association, the first grayling were brought from Yorkshire by train in milk churns, with a young lad being gainfully employed throughout the journey pouring water from churn to churn to keep the containers sufficiently oxygenated! Almost 150 years on, and with numerous pollution issues having clouded the water throughout this passage of time, the Derwent’s grayling continue to be a thriving population. While trout still predominate on the river, the grayling’s presence is seen as a positive benefit, extending as it does the fly fishing season for all anglers that fish this enchanting stream. The Derwent rises on moors to the west of Blanchland, and flows some 30 miles in an east-north-easterly direction en route to its confluence with the tidal river Tyne near the Metro Centre. Forming the border between Northumberland and Co. Durham for much of its course, it incorporates the giant commercial trout fishery Derwent Reservoir in its upper reaches, and is quintessentially a classic northern trout stream with twenty miles-plus of fly fishing available most of the way downstream from the dam. The rights are owned exclusively by two angling clubs, the aforementioned Derwent Angling Association (http://www.derwentangling.co.uk/ known locally as the “upper club”) and the Axwell Park and Derwent Valley Angling Association (the “lower club”). The upper club, which controls water from the reservoir down to Lintzford, is slightly more restrictive: its grayling season ends on Jan 31st, with day tickets for the entire 15 mile stretch available until December 31st from Shotley Bridge Post Office and Fraser’s Angling Shop, Coatsworth Rd., Gateshead. Thereafter day tickets can be purchased to fish on club-owned land only until the end of January. The Axwell Park club, which controls water between Rowlands Gill and Swalwell, allows fishing right through until March 14th, with it too supplementing full membership with day tickets available for £7 (the whole stretch) or £5 (Rowlands Gill Park only) from http://www.apdvaa.co.uk/ , the Rowlands Gill Caravan Park Shop or at the Red Kite Store in Winlaton Mill. Before we investigate a few of the best spots to fish on the lower Derwent, lets have a look at the best technique, and on this river (which is fairly small throughout its course), there is no more rewarding nor effective a method in cold weather than Czech nymph, a modern variation of the more traditional ‘upstream nymph’ technique of fly fishing. Czech nymphing was really designed for use on larger rivers, where an angler would ordinarily be waded in, casting a heavily weighted nymph on a fairly short line a few yards slightly upstream, allowing it to drift down as the fly sinks to a point about 45 degrees downstream. While retrieving line to stay in contact with the nymph, you watch for movement on the end of the fly line that indicates a taking fish, with this almost invariably being seen rather than felt! Due to the size of the Derwent, however, in most places this technique can be employed from the bank (or at least from a point fairly close to it), hence there’s rarely any need to wade deep, and a fly rod of 8 or 9 feet combined with a number 6 or 7 floating line is all that’s required. A cast of say ten yards or less, made either directly or obliquely upstream is my favoured approach, with the line allowed to drift back towards the angler while recovering and watching it carefully for tell-tale pulls against or across the current. The leader needn’t be any longer than about six feet of 3lb line, the weighted nymph being the point fly and any dropper (a second wet fly or nymph can also be added thus, up to a maximum of two flies per cast) being tied on about eighteen inches higher up. Depending on the weight of the nymph used, the point fly will cause the business end of the rig to sink in proportion to the strength of the current, while the point at which the leader joins what has to be a floating fly line – sinking lines won’t work for this – will remain on or close to the surface. 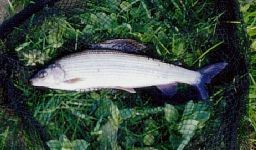 A stronger current will demand a heavier nymph, as grayling are nearly always found near the bottom, and too a light a fly will cause the whole thing to drift ineffectively over their heads. Conversely, too heavy a nymph in too light a current will cause the point fly to sink too quickly, with the infuriating result that you’ll eventually find your ‘take on every cast’ is the bottom and you’ll have to pull for a break. Like with all good fishing, correct balance is the key! While Czech nymphs (the actual flies themselves – ask at the tackle shop!) and various heavily weighted shrimp patterns are often favoured for grayling fishing in winter, in lighter flows traditional weighted patterns like the GBHE and Pheasant Tail can be just as effective, if not more so. Just remember to always make your cast a fair way upstream, as in my experience Derwent grayling won’t take any fly that has started to swing round in the ‘down and across’ trout wet fly mode. If you think about it, it stands to reason why not: at the point at which the cast passes 90 degrees, the combination of pressure from the rod tip and the force of the current start to pull the point fly up and away from the river bed on a tight line – and up and away from where the grayling are lying! If therefore, for whatever reason, you think you’re fishing upstream of a shoal of grayling, don’t be tempted to fish for them from upstream if you can avoid it – just move downstream and cast up! And so to a few of the best places for grayling fishing on the lower Derwent and, the more you fish this river, the more you come to realise that there aren’t actually that many stretches where grayling aren’t to be found! Looking for deeper, swiftly flowing water and areas of uneven current – creases, rock sills or weirs where fast water gushes into a pool – is the key to pinpointing this species. Just remember the simple rule that your fly needs to be close to the riverbed! The most obvious place for catching grayling on the lower Derwent is at the top end of Derwent Park in Rowlands Gill, which is situated alongside the B6314 Burnopfield road near the caravan site. Just look for the big pool that’s formed by the weir directly underneath the road bridge and for best results, cross the river via the bridge (or in the shallows at the bottom of the pool) and fish off the Burnopfield side within the Gibside Estate (which is also ‘lower club’ water). In normal to low winter flows, this pool is about five feet deep all the way down its 30-yard expanse and there’s always a steady current running throughout. Unfortunately, for practical reasons, you can’t fish by the method I’ve just described except at its very uppermost end, although, as this is where the grayling usually lie this isn’t a problem. The main thing you’ve got to watch out for here are the ever-present overhanging branches, although by making false casts low over the water, or by carefully roll-casting your line back upstream each time, this hazard is easily avoided. Wading is necessary, although even in winter, wellies will suffice for the relatively shallow flat rock shelf that you fish off. A word of warning here, however, as a pair of polaroids would be a worthwhile investment – if nothing else, then just to help you see more clearly exactly where this shallow platform shelves off very suddenly – straight into the full depth of the pool! The rest is fairly straightforward – cast a few yards upstream – stay in contact with the nymph and be prepared for palpitations (and to strike!) whenever the line suddenly whizzes off very purposefully either upstream or across! Next on the list of my favoured locations is the river at Derwenthaugh Park – the ‘new’ country park situated alongside the A694 on the site of the old coke works at Winlaton Mill. Park in the car park next to the traffic lights in the village, follow the path down towards the river and turn right. You’re now walking upstream alongside the river and, while this bank can be fished all the way through the park, it’s mostly fairly streamy here and unsuited to winter grayling fishing. Continue following the riverside path, therefore, for about another quarter of a mile and just after the main path swings left and dips down to cross a small stone bridge beside a pond to your right, take the narrow track to your left that leads down to the riverbank. You’ve now arrived at a part of the park called Clockburn Drift (look up Winlaton Mill on multimap, or check the OS map for reference and you’ll see it!). As you reach the river, turn right and, provided the water level isn’t too high, you should see an exposed shingle margin on the near bank a few yards ahead. Here, you’ll find a channel about three to four feet deep running down the far bank for 150 yards from where a small glide breaks at the top of the pool. The shallow margins slope steadily from the near bank all the way along, allowing you to wade easily, although the width of the river means you’ll never need to go very far out. As you’re approaching the pool from its downstream end, work your way gradually upstream, so as not to alert the fish, and employ the same tactics as at Rowlands Gill, watching out for overhanging branches. Do bear in mind, however, that the more sedate current here will normally suit a less heavily weighted nymph! About a fifteen minute walk further upstream from Clockburn Drift is the local beauty spot Lockhaugh Meadows, which for angling purposes is more generally thought of as a trout fishing hotspot in the spring and summer months. There’s no reason why it shouldn’t fish for grayling in winter, however – they’re certainly caught here during the warmer months! The advantage the Derwent gives the winter angler is in the presence of that large reservoir in its upper reaches, and the effect this has on regulating the water levels. While spates do happen, they are much less frequent than on other rivers in the area, and winter levels don’t fluctuate quite as markedly, meaning some streamy sections that might appear too shallow for serious winter grayling fishing may in fact be well worth a shot. Even so, some of the pools at Lockhaugh Meadows – which comprises the inside of a wide sweeping bend in the river just upstream of the imposing Nine Arches Viaduct – are deep enough in their own right, with steep banks on the far side channelling the brisk current through fissures in the rock strata. The top pool – where the river rushes over a rock sill to enter its 180 degree sweep – and the one immediately upstream of the viaduct are deepest and hence the most likely spots to find grayling. To get to Lockhaugh Meadows, continue along the metalled footpath in the direction you were going to reach Clockburn Drift, cross the stone bridge over the river and turn right or left to follow either path round the hill to reach the Derwent Walk path as it approaches Nine Arches Viaduct. Cross the viaduct (its part of the walk – the railway is long gone!) and go immediately left down some steps into the meadow. For the ‘viaduct pool’, turn left at the bottom of the steps and for the ‘top pool’ go straight ahead. The meadow can also be found by following the Derwent Walk from Rowlands Gill towards Swalwell (just over a mile walk) or by going through the woods from the Thornley Woods car park (between Rowlands Gill and Winlaton Mill on the A694). Of course, there are plenty of other great spots for winter grayling fishing on the Derwent, but I’ll leave you to discover those yourself – this is just to get you started. Once you’ve started exploring this beautiful river, you’ll find it almost impossible to stop!